Potent nose of citrusy and slightly resiny hops. Some bready maltiness, with vague fruit and honey notes. Softly malty on the palate, building to a long, characterful hoppy finish. I have had this beer before. I have had it on draft and in the bottle. We actually went to a tapping party at the Beer Sellar that featured several New Holland beers. Oh, and when we were in NYC last we had dinner at a place that was decorated like this. I love the logo and the story, even though I am not familiar with the actual book. But the name is known in all circles. Anyway, I am a BIG IPA guy, and a beer that promises to have a hoppy finish is going to be good in my book. Let’s break it down. In the Glass: In the glass it looks like an IPA. I would say an IPA is the most consistent beer… in the glass, anyway. They always have the same head, a similar lace, and the color is always the same. Nose: A beer like this is supposed to “pop” in terms of the aroma… and this one does. It smells bitter and the hops… it is like you are sniffing a bag of hops. It smells amazing. I wish beers like this came with a hop on the side of the glass, or a hop cone floating inside. That would be awesome! Remember guys… don’t fruit your beer. But you can hop it! Flavor: For a beer with this low of an ABV, it packs a ton of flavor. You can really taste the dry-hop that brings out those aromas, as the beer finishes a little bit on the dry side. Not sure if those two are related, but still. The flavor is that of a good, solid IPA. It will ruin your palate, so don’t expect to drink and enjoy anything else tonight. But it tastes incredible! Mouthfeel: It starts with a rush of bubbles, then mellows out as you swallow. The middle of your tongue just sort of sits there as the hops tackle the outside of the tongue and the top half of the throat. That leaves you with a strong flavor as you swallow and leading to the aftertaste. A good aftertaste is what makes a good IPA… good! Aftertaste: The aftertaste isn’t strong, but it lasts a long time. I don’t need it to be strong, I just like the bitterness to sit there on my tongue for a while. The burp on this one is weak, but the tongue just sits there and holds on to that hoppy goodness. I am a big fan of this beer. I like the label too. 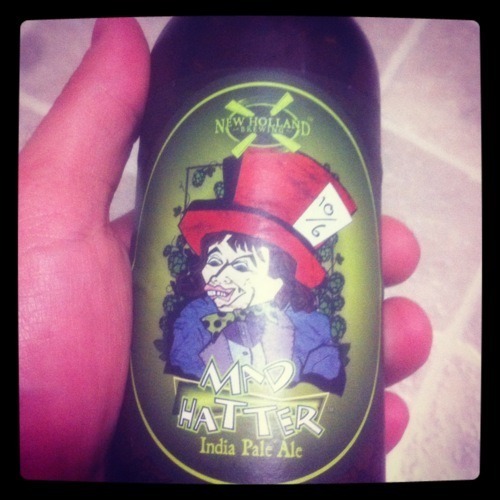 I wonder what they call the double IPA… a madder hatter? Well, we had a first tonight for 1001 Bottles. We started to do a beer and then realized that we had already done it! Oops. Oh well. Moving on to a new one! Tonight’s beer is an IPA. Poured out into the glass, it is a thick cinnamon-orange color. There wasn’t a lot of head, but what was there was a creamy white color. The smell is good – a typical IPA smell of wetness, spices, and hops. It’s not overpowering, but instead smells pretty balanced. Let’s find out what we can expect from the taste. Similar to the smell, the beer actually tastes like a well-balanced IPA as well. It’s hoppy, tastes a bit like cinnamon, with a little bit of bread taste to it also. I know it probably sounds like the way I am describing it that it is pretty boring, but I don’t really feel that way. To me it is more of a good balance. This is an IPA I would buy at the store if I was looking for a good IPA to drink. It’s not too much and not too little. This was a good choice for tonight, and I would likely buy it again. Inky black with a light tan head and great lace. The nose is filled with chocolate and coffee aromas. With a creamy mouthfeel, the flavor profile is dry with espresso and chewy chocolate.